Finally, I could see Darjeeling! The cover of fog was gone. 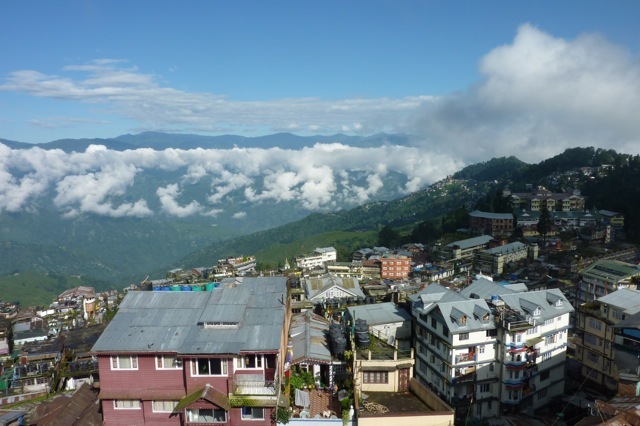 This city in the clouds is a lovely place, its culture influenced by refugees from Tibet as well as proximity to Nepal, Sikkim, and Bhutan. Advocates of the area becoming its own state call the area Gorhkaland rather than West Bengal—that discussion is ongoing, with no clear resolution in sight. I took advantage of the perfect weather to go on the Darjeeling Himalayan Railway, also known as the "toy train." Landslides had stopped the regular daily train journey down the mountain at the moment, but tourists could still take joyrides on the steam train from Darjeeling to Ghum, some 20 kilometers down the track. You're supposed to buy your tickets the day before, but I've become completely slack in my planning, so I just trotted down to the station before departure time. And the train was sold out. That's because the engine is antique—not just in a charming way, but the damn thing barely works as it heaves and puffs its way along the tiny tracks set into the road. 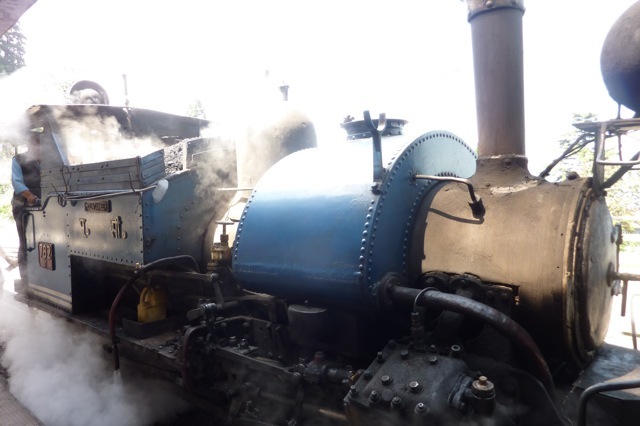 The engine is so frail at this point—a ticket seller explained to me that "We are having some problems with our Indian engine"—that it can only haul a single carriage of tourists at a time. And all the seats were gone. Except they weren't, because I was just a single person. One of the ticket sellers asked "How many," and I responded "One." He motioned me into an office where he wrote out a single ticket and hustled me into the last seat in the corner. And we were off! The locomotive was on backwards. The train had barely left the station before is stopped under a water spout, taking on water until the engine overflowed. The poor train looked like it wanted out of its misery. We sluggishly went up the hill to a panoramic viewpoint, stopped for photos (and to shovel in more coal), then proceeded to Ghum, the engineer waving at friends as we went. 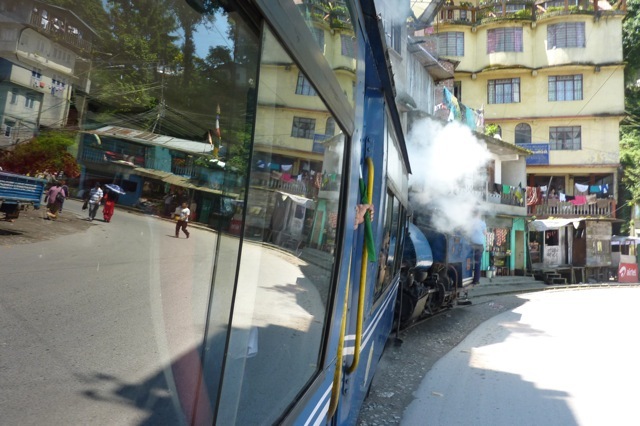 Ghum has a small museum, which the passengers looked at while the locomotive turned around—now it was facing the right way—then the train pulled us back to Darjeeling. What a lovely town! I particularly like the fact that the signs for the train stops look like the ones from the London Tube. But Is It Made Out of Tigers?